Race 9- Shakhimat (#8, 5-1) was very impressive in the Transylvania Stakes last time out and could sneak away from this field on the front end. He has never been better and catches a field without much early speed. Airoforce (#1, 4-1) is a tricky read. His two-year-old form is good enough to win this race, but his three-year-old form has been lackluster. He has yet to run a bad race on turf however; so the return to turf could be the key for a return to form for this Mark Casse colt. Converge (#3, 5-1) won the Palm Beach Stakes before encountering a troubled trip in the Transylvania Stakes. The ultra consistent colt must be left in the mix for Chad Brown and Javier Castellano. Beach Patrol (#4, 8-1) has not beaten much, but he has looked good doing it and has top connections in Phil D’Amato and Flavien Prat. There is no telling where his ceiling is and he should sit a great trip behind Shakhimat. Race 10- American Freedom (#11, 6-1) Trainer Bob Baffert signaled that this colt was special on XBTV AM before his debut by saying American Freedom is his “Belmont Stakes horse.” To get to the Belmont, American Freedom must first win the Pat Day Mile. Based on his promising debut, eye-opening workouts and confidence from his trainer, this colt should be too much to handle for the rest of this field. He is the key to this lucrative Pick 4 sequence. Race 11- Grand Tito (#1, 12-1) was on a roll before encountering a nightmare trip early on in the Pan American Stakes. He hopped at the start and was extremely rank throughout. He took the lead at the top of the stretch and understandably got run down. 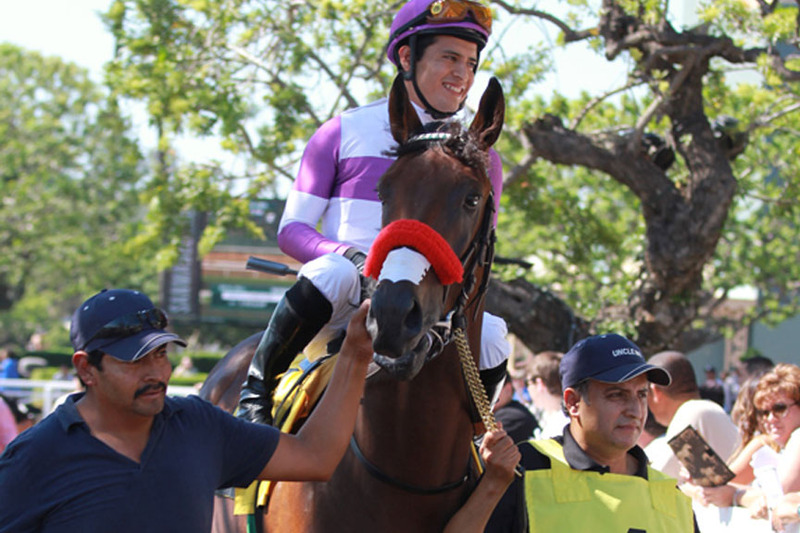 Emisael Jaramillo, who won twice on this horse, is back aboard today. Bolo (#3, 8-1) also received a strange ride last time out. He was taken out of his best game, while last early. His comeback win in the Arcadia Stakes when stalking the pace was awesome. Look for a similar ride in this race. Divisidero (#8, 15-1) makes his third start off a layoff and stretches out to his preferred distance. He has a fantastic closing kick and offers great value at 15-1. Big Blue Kitten (#12, 5-2) is the most accomplished horse is the field, but is a bad favorite in this spot. He is coming off a seven-month layoff and draws post 12. He should be included on class alone, but he is far from a cinch in this race. Race 12- Nyquist (#13, 3-1) is the definition of a pro. He has beaten everything thrown at him and has shown the ability to dig in when he has to. He should sit a perfect trip just off of Danzing Candy and Outwork and will get first run on all the heavy closers in this race. California dirt horses have proven time and time again that they are superior to the rest of the country and this year should be no different. Speaking of California, Mor Spirit (#17, 12-1) appears to be the only horse that can beat Nyquist. He is a grinder, but he can lay close enough to the pace to be in striking position and he looks to be crying out for the mile and a quarter distance. He has faced tough competition in his Derby preps and has yet to be aggressively ridden to the wire. The tank should be full on Derby Day for Baffert and Stevens, a potent Kentucky Derby combo.